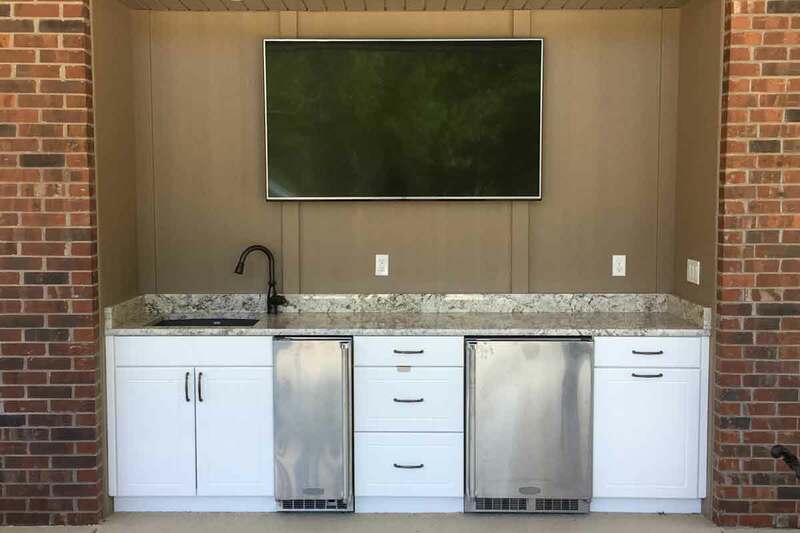 Installation of Werever outdoor cabinets does not require previous cabinet installation experience. A basic knowledge of common hand tools is required, but extensive knowledge of carpentry is not necessary. Almost all of the projects in our photo gallery are of first-time installations. These projects are of either DIY installed projects, or with a hired a handyman or contractor. You can expect your first project to be successful with a minimal learning curve. Print / Download PDF installation instructions. If you have questions, please call (813) 241-9701. 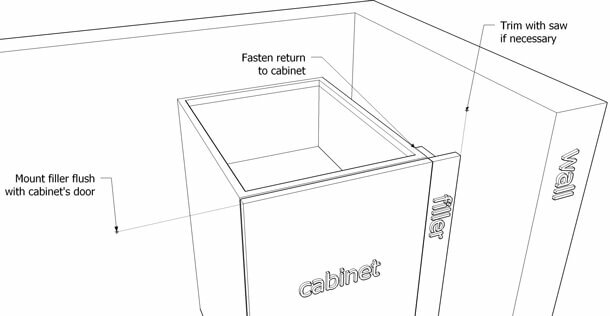 Before you begin, familiarize yourself with your cabinet’s layout. 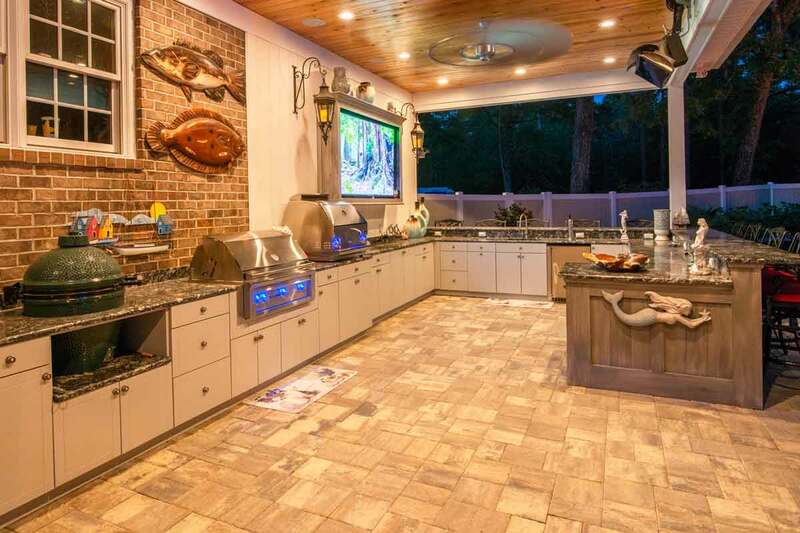 It is a good idea to lay out your entire outdoor kitchen before you even begin to level or fasten anything. All of your project’s hardware will be included in a sealed bag. The hardware has been carefully counted for your projects’s layout. Installation will be much easier with two people, although it is quite possible for one person to install the cabinetry alone. Leveling the cabinets is the most important part of installation. If you do not level the cabinets properly the doors will not align. Level the cabinets by beginning at the highest point of the sloping surface. Shorten the legs at the highest point of the slope. Establish a level line at the countertop height. Level the cabinets front-to-back and left-to-right. Plumb the cabinets vertically using a level. Level the cabinets front-to-back and left-to-right using a level. Check the inside using a carpenter’s square to make sure the cabinet is square. Make adjustments using the leveling legs. Once leveled, fasten cabinets to walls using common hardware (not provided). For concrete block or stucco walls, stainless steel Tapcon® fasteners are recommended. Two fasteners per cabinet are recommended for base cabinets, four fasteners are recommended for wall cabinets. Fasten with 3/16″ x 2 1/2″ Tapcons if the wall is concrete or block. For other walls, use a fastener that is appropriate for your wall. All cabinets and fillers have partially pre-drilled “universal fit” holes that are perfectly aligned for a precision fit. Finish drilling the holes of two adjoining cabinets using a ¼” drill bit and then fasten the cabinets together using the provided hardware. 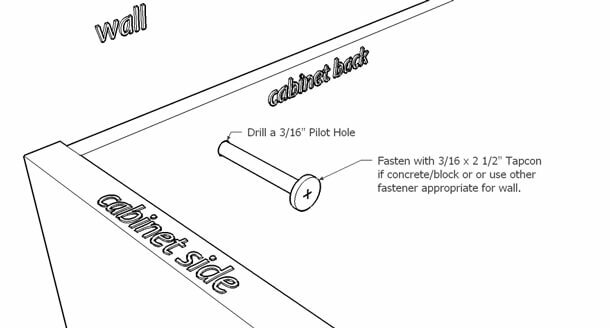 Finish the pre-drilled holes on each cabinet using a 1/4″ drill bit. Tighten both sides of the provided stainless steel bolt using a phillips head screwdriver. For a do-it-yourself project, a tile countertop is recommended. 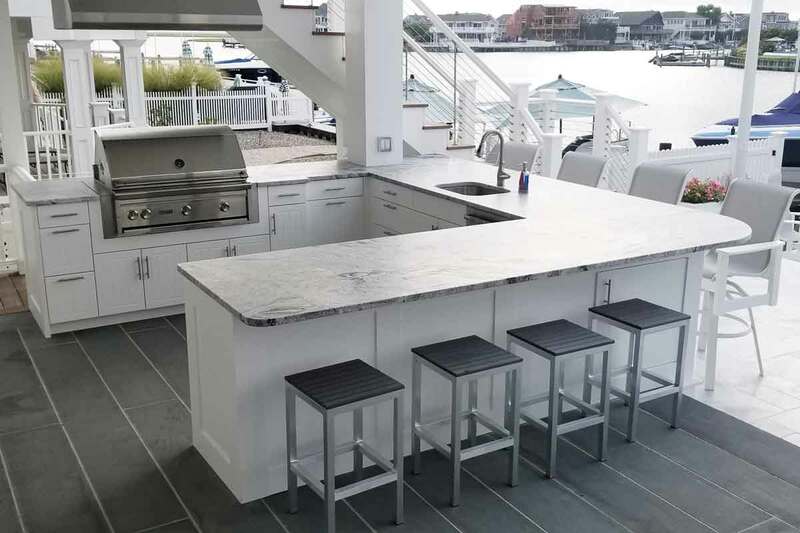 Professional countertop fabrication is recommended for granite, concrete, quartz (Silestone® or Zodiaq®), or solid-surface acrylic (Corian®) countertops. 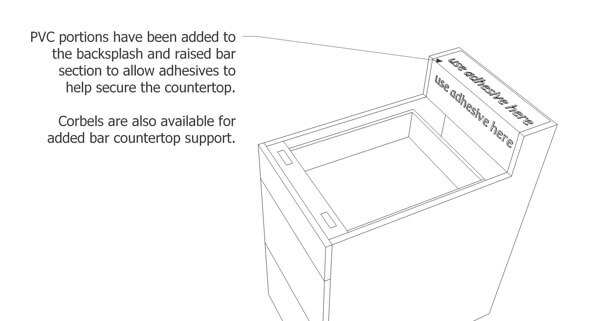 Cabinets feature special countertop installation aids. 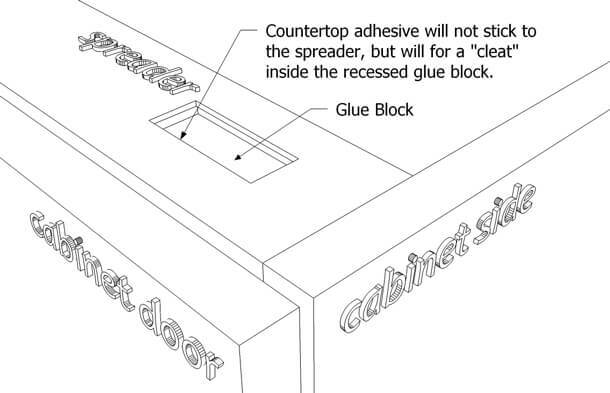 Countertop adhesive will not stick to the spreader, but it will form a cleat inside the recessed glue block. Gluable portions have been added to the backsplash and raised bar section to allow adhesives to help secure the countertop. Corbels are also available for added bar countertop support. Holes can be easily cut in cabinet backs, sides, and bottoms for plumbing, gas lines, or electrical work using ordinary hand tools. Cabinet corners and joints should not be cut as that will alter the structural integrity and strength of the cabinet. Morse Hole saws are not recommended. The HDPE shavings (or saw dust) tend to melt inside these bits. A jig saw or paddle bit is recommended. If necessary, holes can be cut in the sides, back, and bottom of the cabinetry. Do NOT cut through any of the structural seams of the cabinetry. Depending on your design, you might have fillers. And depending on your actual situation in the field, the fillers may require trimming. Fillers are secured to the neighboring cabinet by attaching the return piece using the supplied stainless steel bolts. Fillers will have the same pre-drilled pattern on the return piece that cabinets have. Fillers should be mounted so the face of the filler is flush with the neighboring cabinet’s door face. Fillers can be trimmed with a table saw (or circular saw) if necessary. You can cut the filler with an ordinary woodworking saw. Fasten the return piece of the filler to the neighboring cabinet using the supplied stainless steel bolts. Be sure to mount the filler flush to the cabinet’s door. Trim the filler’s width using a saw if necessary. Screws – It is very important that you use the supplied screws that are the proper depth for securing the panel. Look for the pre-drilled holes on the inside of the cabinet. Use the supplied screws to secure the panel in these holes. Once your cabinets are installed, optional toe kick panels can be added. 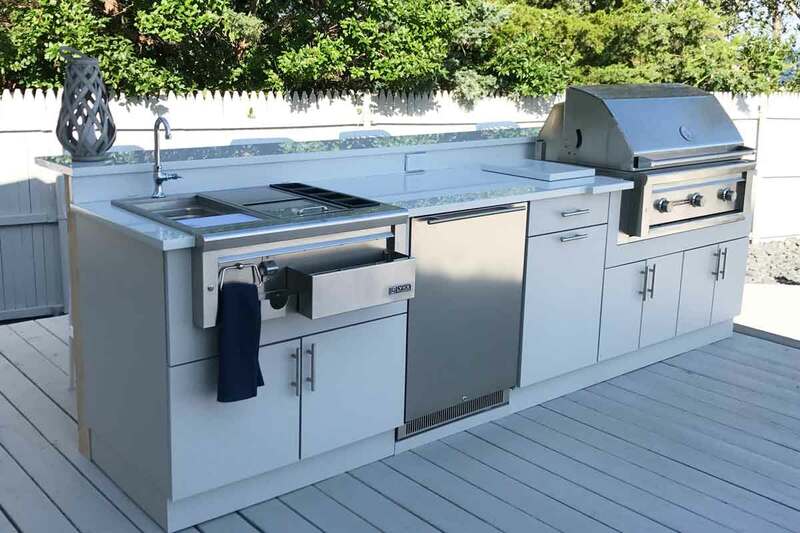 For easiest cleaning and maintenance, you may consider omitting toe kick panels, allowing complete access underneath your outdoor kitchen for vacuuming or hose-washing. Toe kick panels can always be ordered and installed after the project is completed if you want to decide later if toe kick panels should be used. 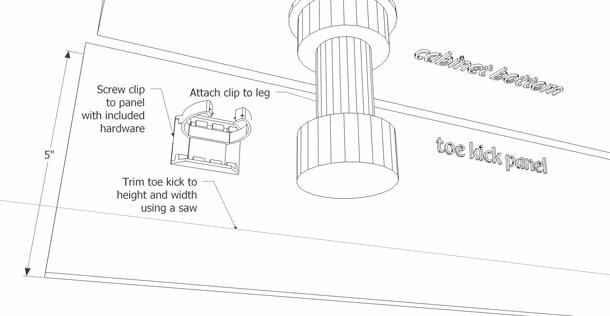 Trim the toe kick to height and width with an ordinary woodworking saw. Screw the supplied clip panel to the toe kick panel. Attach the clip to the leg. 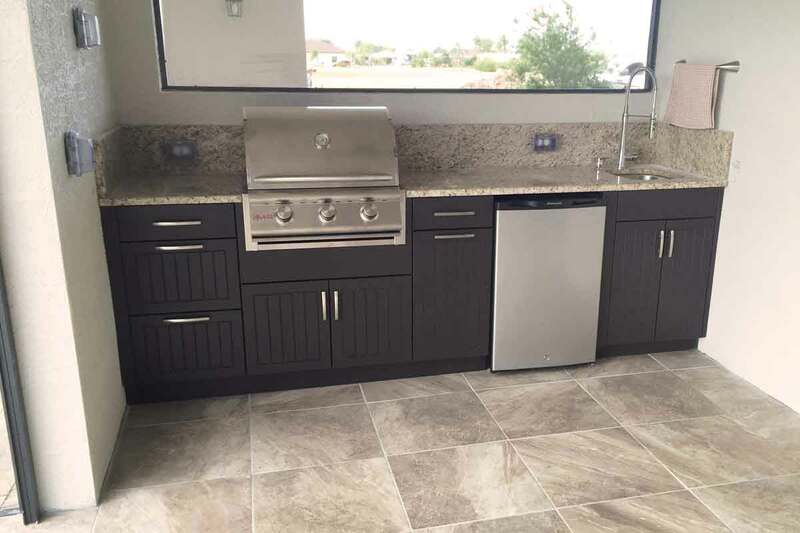 Drop-in style grill cabinets come with a movable “T-Bar” Brace. 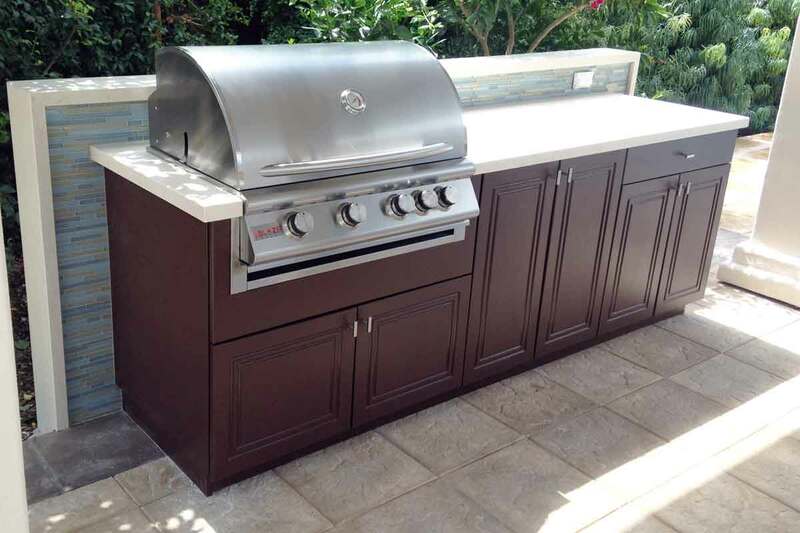 There is not an industry standard among grill manufacturers for gas or wiring locations. The brace is movable to allow installers to position the brace appropriately, allowing clearance for gas fittings and/or wiring harnesses. 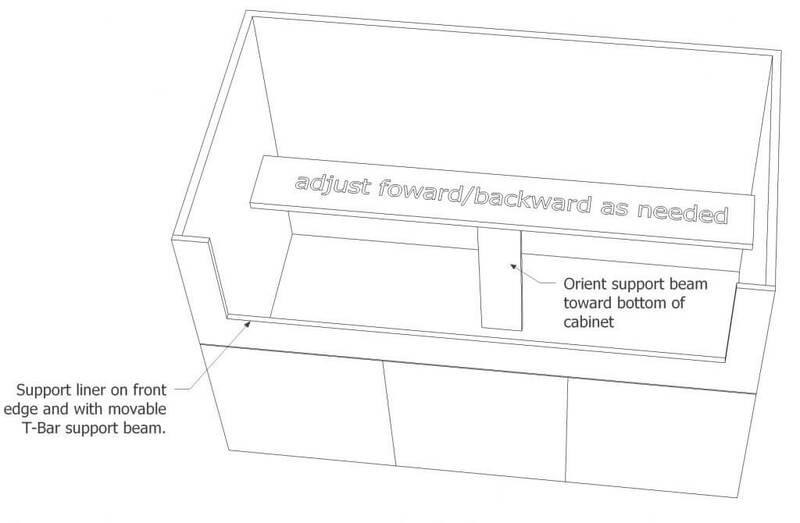 Wall cabinets should be supported by a minimum of four (4) anchors, placed in each corner of the cabinet. It may be appropriate to add more anchors. Werever does not include wall cabinet fastening hardware because the appropriate hardware will vary depending on your wall’s construction. 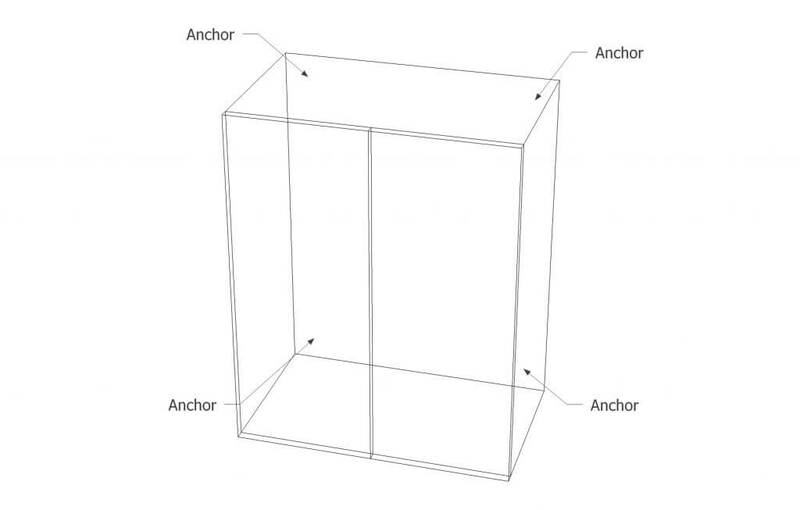 It is very important that you choose an anchor suitable for your wall’s construction and that the anchors fasten to a structural element within the wall. It may be necessary to place shims behind the wall cabinet when anchoring. If your wall has any bow or curve, over-tightening anchors without shims can distort the cabinet shape and cause door alignment problems. 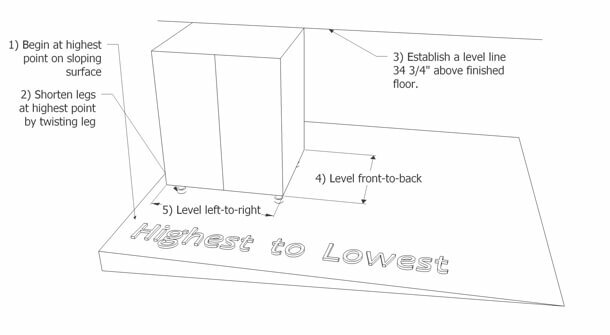 The wall cabinet’s “box” should still be plumb, level, and square after installation. 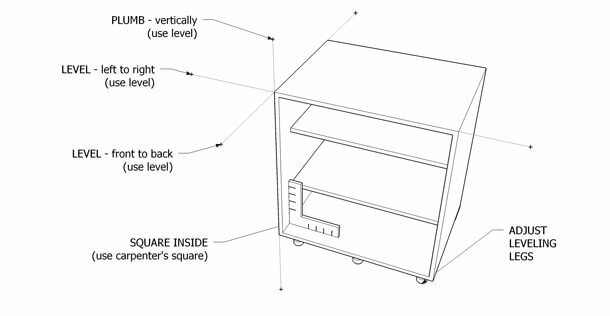 Unlike base cabinets that can be adjusted with leveling legs, the wall cabinets rely on proper anchoring with shimming as appropriate to achieve a squared shape.